WHAT IS ALL THE TORRES DEL PAINE BUZZ ABOUT? The wind is roaring and the glaciers are melting into the deep blue lakes. After trekking to the mirador (lookout), you peer into The Valley of Silence. A granite wall of soaring slabs ends with the three iconic Paine peaks each its own world class setting topped by twisting turrets, ice mushrooms and misty clouds reddened by the sun. The much photographed Paine massif towers above you. This can be no other place in the world but Chile’s Torres Del Paine National Park. Remoteness has kept Torres del Paine blissfully slumbering since the park opened in 1959. It wasn’t until British mountaineer John Gardiner established the Circuit Trail in 1976 allowing access into the park’s remote interior and its Valley of Silence that trekking took hold. Paine massif, the wind and glacier sculpted three spire set piece, remains little climbed although much photographed. The tallest peak in the park is Paine Grande and has only been climbed three times, the latest in 2011 when it was premeasured and downsized to just under 9,500 feet. Some say there are higher peaks yet to be accurately measured in the park. Although a 2,800 kilometer, 31 hour drive from Santiago, Chile, improved air connections (four hours) and infrastructure development have put the park on the outdoor bucket list map. Tourism is steadily rising, cresting to 140,000 last year (compared to 40,000 on Kilimanjaro and 1,000,000 at Machu Picchu), Torres del Paine remains one of the world’s unspoiled, spectacular places. Its location at the southern end of the Andes on Antarctica’s icy doorstep provides its geologic and bio diverse uniqueness. 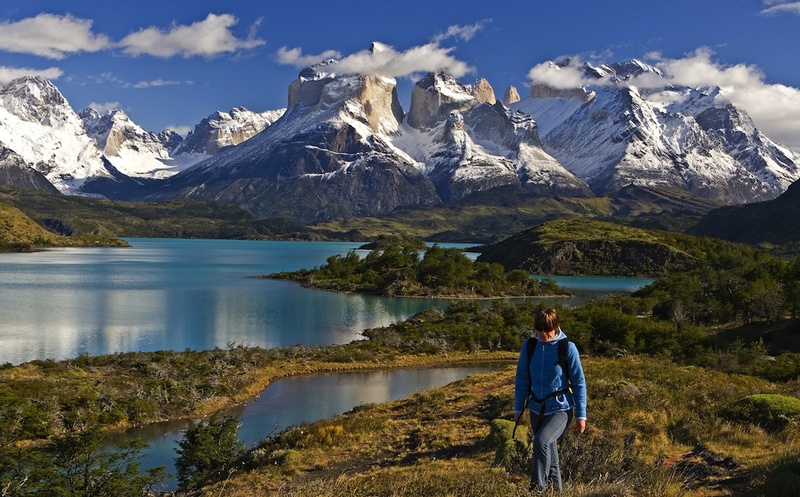 The challenge and rewards of trekking Torres del Paine are many. There are two major trail systems, the shorter W route and longer Paine Circuit. Both move parallel to the long azure glacially fed lakes and brush up against massive glaciers. There is not a day on either trek where there aren’t world class views. However, the weather is capricious. The wind is a certainty, making stream crossings that much more painstaking. Rain or snow must be accommodated even in South America’s summer when heat is never an issue. The trails are marked, yet game trails followed by numerous guanacos and Andean deer often mistakenly lead unguided trekkers off the main routes. Going on a guided trek is the best way for first timers. Tusker is putting all its Chilean eggs into Southern Patagonia’s basket. The trip will be offered in November 2018. Then in March and November 2019. Expect Tusker’s consistent quality food and guiding service, but in a unique setting. Although not a peak-bagging experience, trekking in Torres Del Paine is challenging and requires the same sense of adventure and ruggedness that makes Tusker’s trips in Mongolia so special. Rev up the cameras and rainproof clothing for perhaps Tusker’s most unique adventure destination – Torres Del Paine National Park.